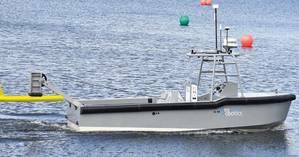 Florida-based SeaRobotics Corporation, which specializes in small, smart vessels that are remotely or autonomously operated, has completed its factory acceptance testing of its new entry into the autonomous surface vehicle (ASV) workboat market - the SR-Endurance 7.0 meter (22.96′) system. According to a press release from the the innovator behind the HullBUG, a groundbreaking hull cleaning ROV, and the HYCAT, the system is optimized for sonar research through the utilization of an optionally manned helm configuration and a serial diesel electric propulsion system. Outfitted with an instrumented launch and recovery system (LARS), and supporting hydrographic winch system, the SR-ENDURANCE 7.0 is capable of deploying towed sonar/instrument systems, dipping sonar/systems, or ROV systems. "Having built numerous ASVs in the 6-11 meter range, we are now offering a commercial workboat for the research and survey markets," said Geoff Douglass, SeaRobotics ASV development manager. "In many operational scenarios the advantages derived from a variable depth sensor such as a multi-beam or side scan sonar, sub bottom profiler, or magnetometer, as well as the surface motion mitigation, make towed systems valuable in autonomous operations," Geoff added. With an impressive endurance of up to 6 days at survey speed, and up to 10 hours between automatic battery recharge, the 80 HP, SR-ENDURANCE 7.0's remarkably quiet platform for sonar/sensor research belies its 80 HP strength. The multipurpose LARS and payload interface enable the integration of numerous user configured payload systems. A standard 6-inch pipe flange with cableway is mounted under the hull to provide additional instrument mounting options for additional instruments. The optionally manned helm enables manned operation in congested waterways and for ramp operations when required. With the flip of a switch, semi-autonomous operations, remote piloting and direct remote-control functionality is provided. Navigation is supported by a pre-programmed, or remotely operated pan/tilt/zoom video system, 360-degree video coverage with 4 situation awareness cameras, RADAR, AIS, low bandwidth Iridium, and a high bandwidth line of sight RF link. Many more options are available. The SR-ENDURANCE 7.0 workhorse ASV can be configured with various propulsion configurations. The aluminum general purpose hull offers a large back deck area for mission reconfigurable payloads of various types. "We were delighted to design and build this new system, one which proved to be of critical importance to the research of the US Naval Research Laboratory (NRL)," stated Don Darling, President of SeaRobotics.